Before this product, I didn’t question how I secured myself on the back of the bike. Either hug the rider or use the passenger grab bars. It’s tiring to fully encircle the rider with your arms on a long trip. Not to mention you bump helmets when you’re riding up that close all the time. The passenger grab bars are all right when you’re going straight and slowish. They aren’t comfortable or secure when turning or if you’re going over 25 mph. 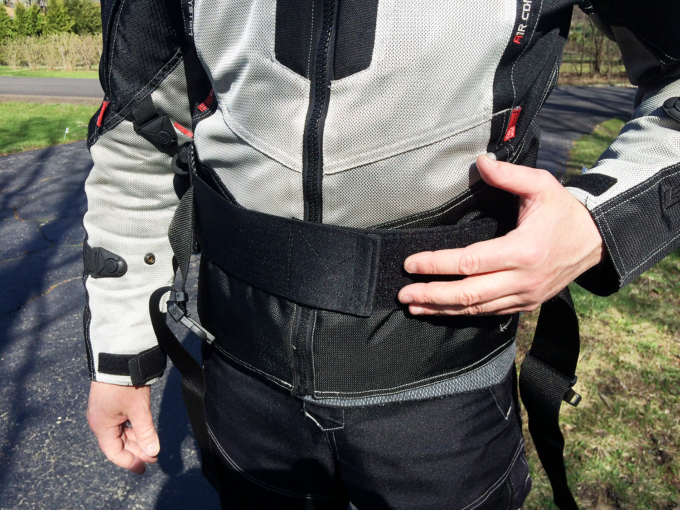 We went for a ride down Sheridan Road to test out the Grip-N-Ride as soon as weather permitted. The belt is simple to put on. 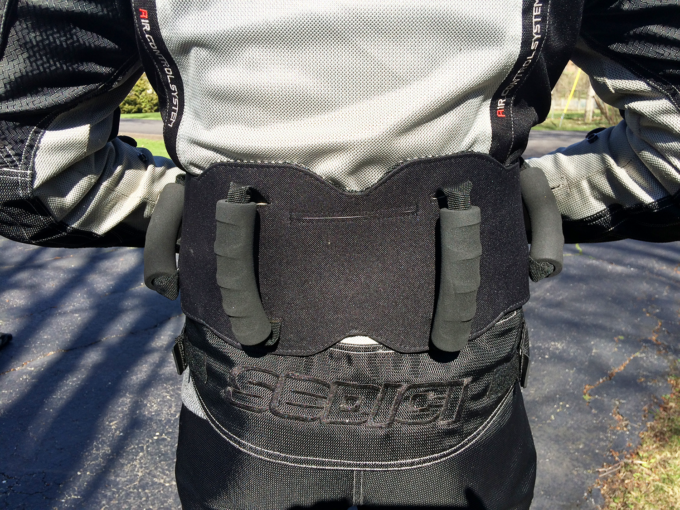 There’s an adjustable velcro strap that’s long enough to fit around a 28 to 54 inch waist. A second adjustable strap with an integrated clip fastens in front of the velcro straps. It’s lightweight and didn’t slide around or up and down. 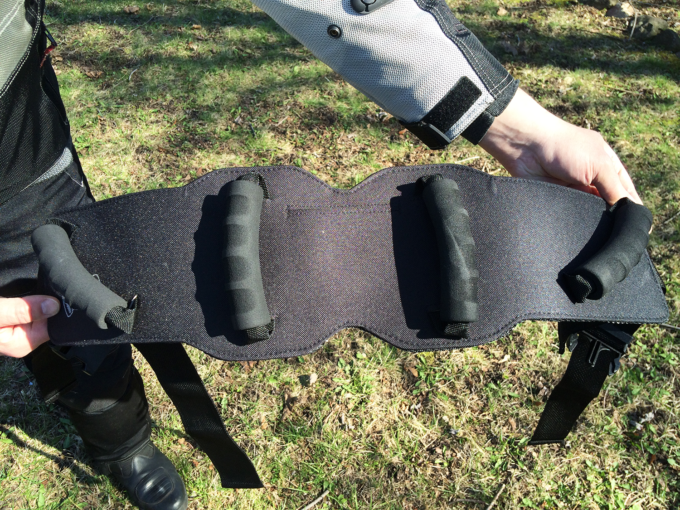 It didn’t affect the rider’s range of motion whether standing or riding. He wasn’t annoyed by the extra piece of “clothing” and he liked the additional lower back support. 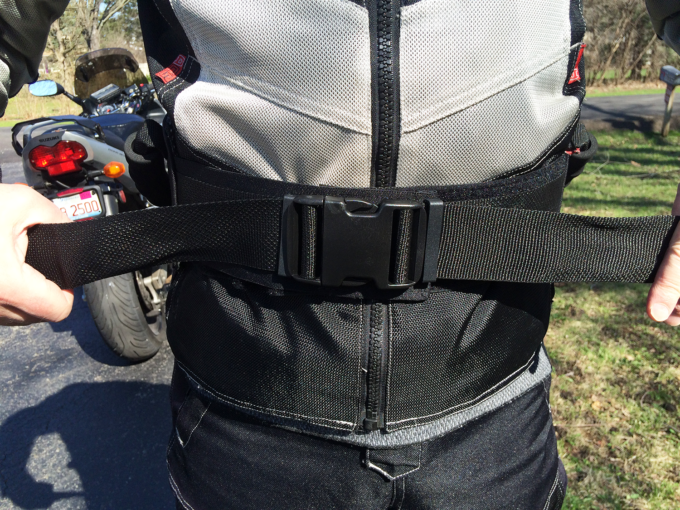 One critique is that if you fall into the smaller end of the waist spectrum, you’ll end up with noticeable strap slack and no built-in way to keep the extra length of straps from flapping around while riding. This didn’t bother my rider. 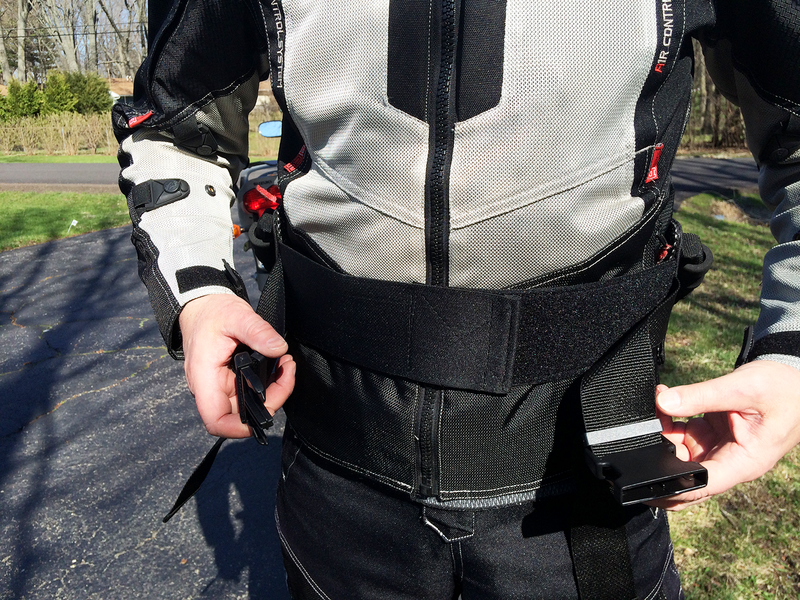 The straps aren’t long enough to be a safety issue while riding, but some might find the hanging straps annoying. One solution might be to cut and then melt the frayed nylon (carefully) with a standard household lighter. 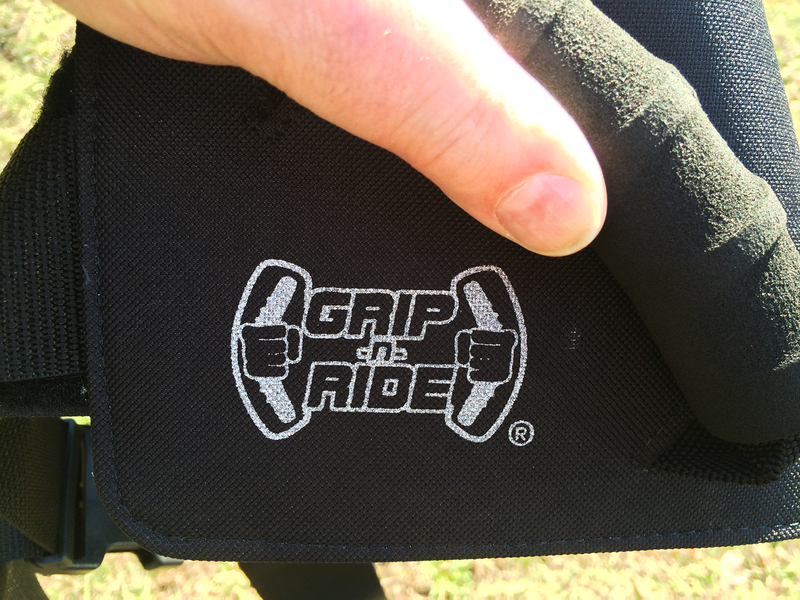 The Grip-N-Ride provides passengers with something secure to hold onto. Made in the USA, the grips feel secure and stable. As the passenger, I feel it delivers. As the passenger and focus of the belt, I felt like it delivered. I tried both hold positions and preferred the grips on each side of the waist. The grips right in front of the passenger that rest on the rider’s lower back felt a little awkward and unnatural for me, but you have both options depending on your preference. Sport bike versions are available which incorporate front-side handles as well. The grips feel secure and stable. You can tug hard and not worry about ripping them off of the belt. The product is well made with no stray threads or fibers. Maybe it’s because it’s made in the USA! I could comfortably and conveniently hold on to the rider and felt more secure than if I had my arms around his waist. It reduced helmet clash. Holding onto to the rider in standard riding position, I had to pre-emptively choreograph my body position calculating the distance of our bodies and stopping distance or our helmets would hit. Not hard, but why deal with that if you don’t have to?The Grip-N-Ride provides enough distance between us but I still feel safely anchored. 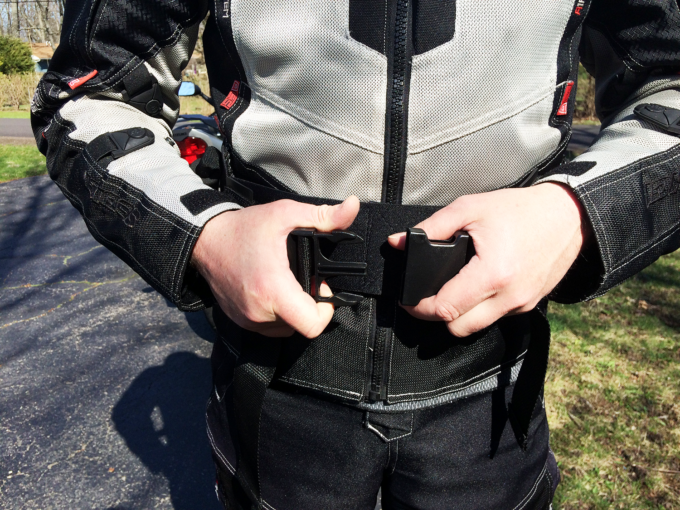 We tried a few maneuvers to see how hanging on to the grips of the belt compared to the standard way of hugging the rider or using the grab bars. We took slow leans, deep leans, sudden stops, quick accelerations, slow straights and a fast straight. As much as I love hugging my rider, the belt felt more secure, stable and convenient. Something to note is the finger space between the grips and the belt is slim. 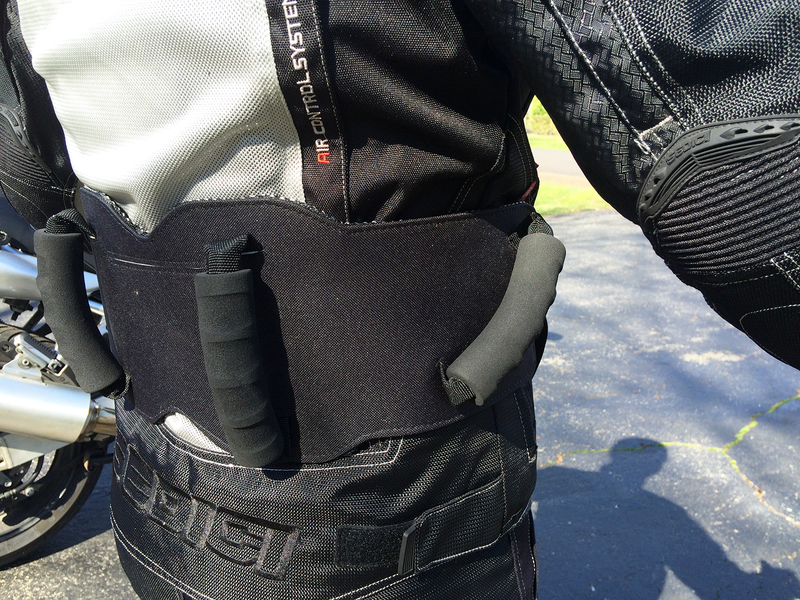 With riding gloves on, you can’t comfortably slide your hands all the way around the grip. I have small thin hands and there’s just enough room to slide your fingers under the notches of the grip. It didn’t bother me as I still felt I had a good hold. Some other bells and whistles to consider: you can have a custom design of your-flashy-own on the belt, there are optional color schemes and reflective trims, it’s waterproof and CE approved. There’s also a cell phone pocket in the back of the belt for the passenger to use. I didn’t find it that useful as the pocket wasn’t deep enough to alleviate my fear of the phone slipping out. If you’re rocking an iPhone 6, don’t bother. Especially if it’s in a case. The Grip-N-Ride didn’t cramp our style or impair range of motion. 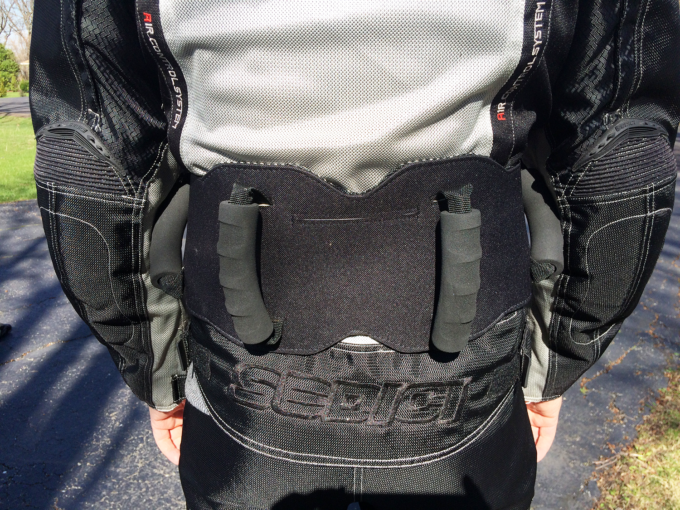 Having tried it out, I want to use it every time I’m riding pillion and especially for longer rides. We give it a TRO thumbs up. 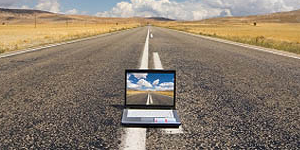 What Passenger Comforts Do You Employ? 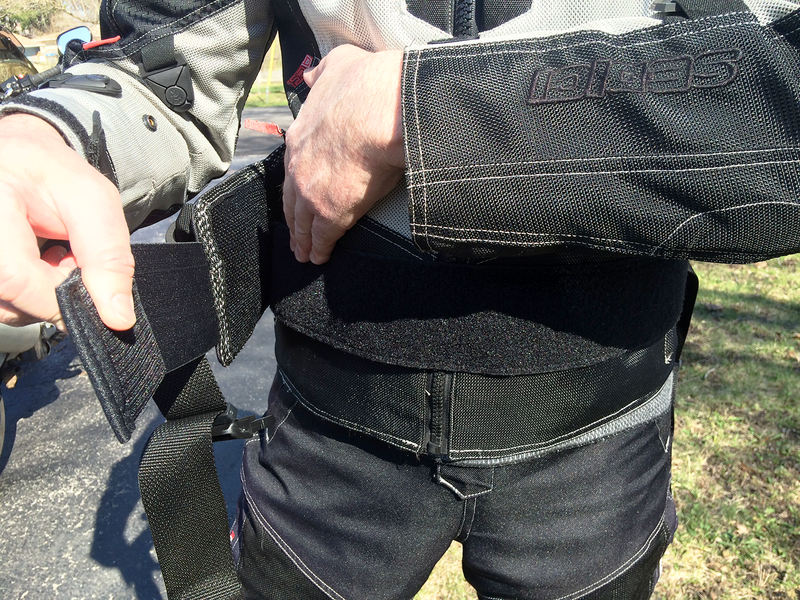 There are additional products which benefit the pillion on the market. Which have you tried? What do you or your passengers like about them and why? Your input is invited. Post an article!